The ceiling of the State Senate Chamber. 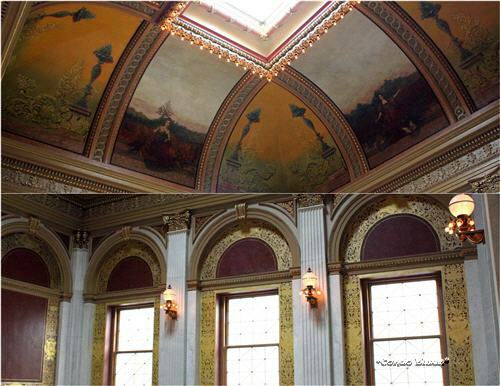 There are skylights with stained glass among the ornately carved recessed squares in this room. 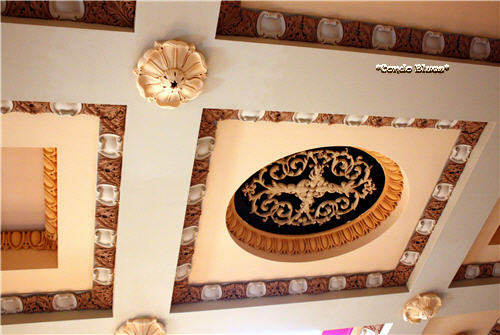 The main rotunda ceiling. 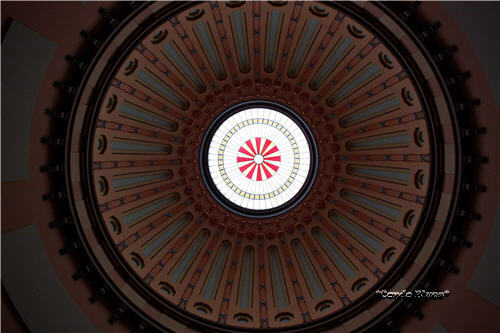 It is difficult to see the detail in the photo, but there is a stained glass version of the Seal of Ohio in the center of the stained glass that tops the rotunda dome. How did I get this photo? By laying on my back in the center of the room and pointing my camera up. It amused of our friends. It didn't phase Husband. He is used to this kind of thing from me. Columns in the Ladies Gallery viewing gallery in the Senate Chamber. It was around this time they fired the original architect for spending way too much money and making the building a bit too grand. 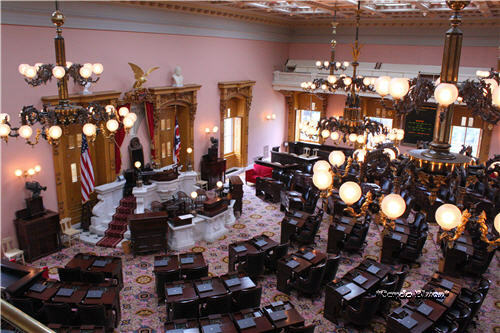 The new architect and designer's first project was the Ohio State House Chamber. 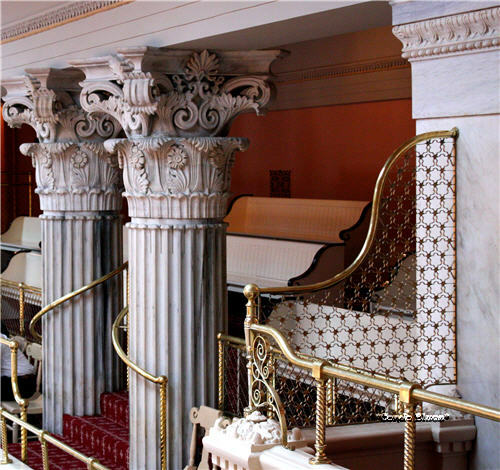 It is a less grand and less ornate version of the State Senate Chamber. An example of how they tried to curb further expenses are the doorways. 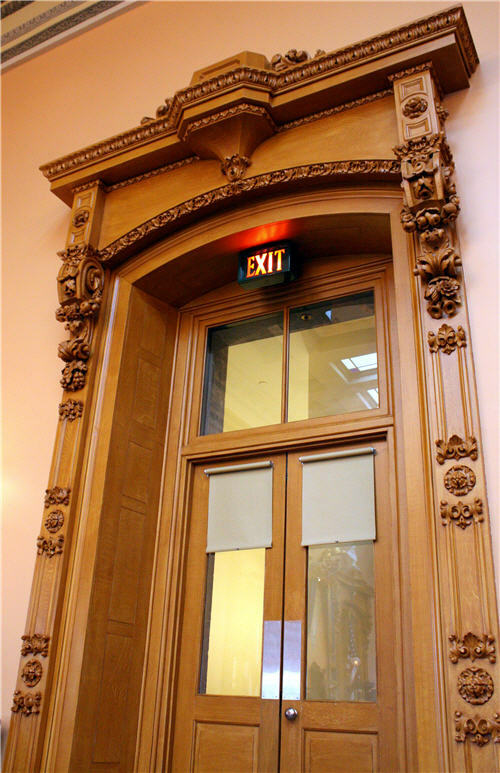 They used less expensive popular for the carved door and window moldings and a painted faux finish wood grain to get an expensive look for less. Husband and I like stained glass. 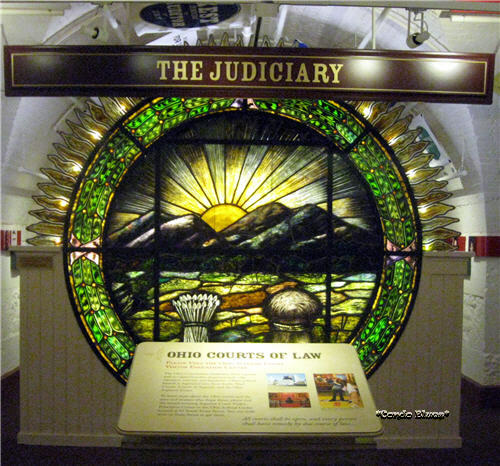 We made a beeline to the Statehouse museum because of the giant stained glass Seal of Ohio on display. Can you believe this older version of the state seal was hidden away for so many years it was almost considered lost? They rediscovered it during a recent renovation and put it on display. Once upon a time, this seal lived in the center of the stained glass insert in the main rotunda dome. The colors in the stain glass pop because the display is back lit. Again, this is something any one of us can do at home on a smaller scale.